The top 11 low carb myths, I bet you’ve heard them already – it’s dangerous, it’s unhealthy, it’s unsustainable, it’s restrictive, there’s no evidence – well let me explain why all those low carb myths are unfounded, and in fact, I can show you how each of the low carb myths can be counter-argued. 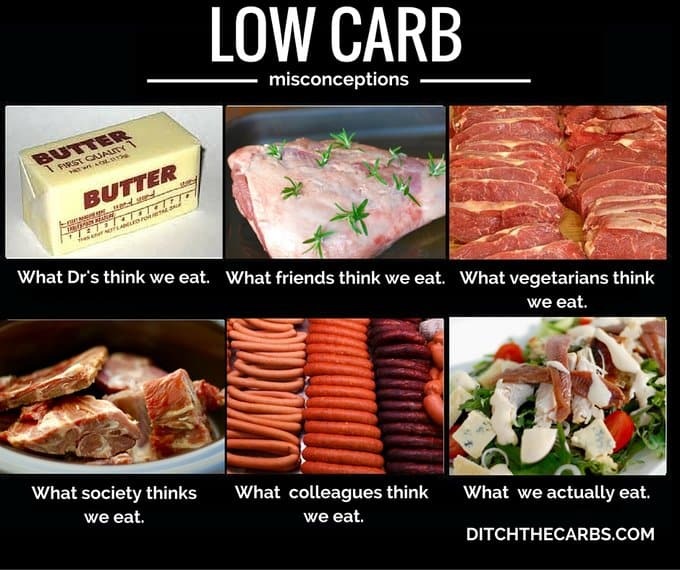 Generally low carb myths are being circulated by those who may not have researched low carb and make assumptions, or by those who haven’t caught up with the science. Studies continue to support the fact that low carb is an excellent choice for weight loss, heart health, diabetes (T1 and T2), nutrition, gut health, mental clarity and more information is coming to light regarding the ketogenic diet in the role of adjunctive cancer therapy. We eat no carbs and we restrict fruit and vegetables – firstly we are low carb not no carb and secondly there are no essential carbohydrates known. We have essential fatty acids and essential proteins, but there is no such thing as an essential carbohydrate. We eat fruit, but we choose nutrient dense fruit such as berries, but stay away from high sugar tropical fruits such as mango, bananas and pineapple. When we do eat carbs, it is from nutrient dense lower carb vegetables, nuts, berries and dairy. Our vegetable intake for most people actually increases. We remove the processed carbs from our diet and replace them with more vegetables. We no longer use carbs such as rice, pasta and bread to bulk up our meals, we use vegetables. We eat far too much meat and protein – sorry, another myth. We eat moderate protein. Too much protein is converted into glucose in the body via gluconeogenesis. We also advocate to eat meat that has had minimal intervention such as steaks, roasts, drumsticks, organ meats. There is a vast difference between processed meat such as hotdogs and burgers to meat such as steak, roasts, chops and ham on the bone. Protein is required for essential amino acids. Our diet isn’t varied – We eat a full variety of whole foods. When you take out the carbs what is left? Everything else. Take a look at the picture below. A high carb diet actually crowds out nutrition. A low carb diet crowds out junk. A sandwich has very little nutrition (with only a few scant nutritious ingredients inside) compared to a large salad. Having sushi for example, is the equivalent of eating white bread (in terms of carbs) and very little nutritious fillings inside. Take a look at this sushi autopsy. In fact when you go low carb, your diet will consist of meat, vegetables, fruit, nuts, seeds and healthy fats. Click on my recipe finder, you will see how varied our meals are. Many who have gone low carb say they have started cooking for themselves for the first time and love experimenting with new recipes and new foods. We are restricted to what we can eat – again another myth sorry. We restrict the products we eat. Do you know every year thousands of new products come into the marketplace. Do you also know that 85% of them have some form of added sugar? We eat a huge variety of foods, just not processed products. The problem in modern times is that so many products or fake foods contain sugars and grains, so it may appear that we are heavily restricted, but only because there are thousands of products available which we choose not to eat. By removing processed food, you almost become low carb by default. Low carb isn’t sustainable long term – myth again. Studies continually show that once people go low carb and give up sugars and grains, they do it for good. That is part of the success of such a way of eating as once you learn how damaging these are to our bodies and appetite, you actually don’t want to touch them again, rather than constantly fighting your will power. Maybe that’s why the sugar and grain industries are fighting back so vehemently. Once they lose a customer, they lose them for life. We are tired because we need carbs for energy – most people report that they have never had so much energy. Fat is a far more sustaining fuel than carbs. Once we use up all our stored carbs (glycogen) we switch to fat burning mode. We have an almost unlimited supply of energy in our fat stores. You will no longer be on the sugar roller coaster, with afternoon slumps and evening munchies. Low carb is another fad diet – humans have been eating low carb for thousands of generations, it is in fact our current high carb guidelines that should be seen as a fad diet. People tend to use the term ‘fad diet’ as a derogatory term when diets don’t work, but low carb works and it works long term. Entire populations thrive on low carb diets. The first book was published in 1862 by William Banting and Dr Harvey who prescribed weight loss by eating no bread, no pasta, no sugar, no beer, no starch – only meat, fish, and vegetables. Ask your grandparents what they did to lose a little weight – they stopped eating bread and potatoes. All that fat will give us heart disease – nope. Study after study has repeatedly shown us that it is the carbs in our diet that increases inflammation, creates the dangerous form of LDL cholesterol carrier (tiny, angry oxidised LDL), raised triglycerides, raises our risk of heart disease and Type 2 diabetes (which is one of the biggest risk factors of heart disease). Eating low carb and healthy fats actually reduces every single risk factor. Reducing your carbs will reduce your triglycerides (best predictor of heart disease), reduce blood pressure, improves HDL and improves the size and type of LDL. Read further on the cholesterol myth to really understand how important cholesterol is to us, and having a low level is just as much of a concern as having the wrong type. We don’t eat enough fibre – Hmm, all those leafy greens we’re getting isn’t enough? Nuts, seeds, coconut? But how much fibre is enough anyway? The myth of losing fibre from wholegrain bread is a persistent myth. Wholegrain bread is quite often processed then the fibre and grains added back in then fortified with vitamins. I’d rather get my fibre from whole foods with minimal human intervention. Ketosis is dangerous – firstly going low carb does not necessarily mean you will be in ketosis all the time, but actually most people frequently are anyway and they don’t realise it. Ever wonder how you survive your sleep and are not eating? Your body switches to fat burning once all it’s glycogen stores are used and will run quite happily on fat. Fat is released from your fat cells into your blood stream, these fatty acids are turned into ketones which fuel the body and brain. Ketosis is entirely different to ketoacidosis. Ketoacidosis is a condition that occurs in Type 1 diabetics where the level of ketones in the body cannot be controlled, it makes the blood acidic and can be fatal. See this infographic which illustrates the difference of ketosis vs ketoacidosis, then click here to be taken to an incredible article on ketosis. Our brain needs glucose as fuel – our brain can be fuelled by both glucose and ketones, which is how the human race has survived famines and periods of fasting since time immemorial. The brain can efficiently run on ketones, in fact this is what gives many people such mental clarity and continuous concentration that they have never experienced before when on a high carb diet. A ketogenic diet has an anti seizure effect for those with epilepsy. Ketosis is also a better environment for neuronal recover and repair, reduction of seizures and prevention of Alzheimer’s. If any glucose is required by certain parts of the brain, our bodies can produce it from protein through gluconeogenesis. So it appears that glucose is not the preferred fuel for the brain at all. So is low carb is dangerous? – By reading all the low carb myths and research that counter-argues them, hopefully I have managed to put some uncertainty at rest. Why do others claim low carb is dangerous? The above myths just aren’t true. What is dangerous however, is eating processed food, and the incredible high carb diet which the majority eat, leading to obesity, heart disease, insulin resistance, Alzheimer’s and if that hasn’t convinced you, here’s another 30 reasons why sugar and carbs are bad for us. Low carb improves our health in almost every way – weight loss, reduces hunger, improves metabolic syndrome, improves blood lipid profiles, reduces risk of heart disease, reduces blood pressure, improves insulin sensitivity and improves glycemic control, reduces triglycerides, reduces risk of T2 diabetes, cancer, Alzheimer’s, and low carb diets are easier to adhere to versus low fat diets. Reducing our carb intake and preventing insulin resistance can be one of the most powerful things we can do to live a long and healthy life. Below, the Diet Doctor shows how those on a low carb diet may chose to eat 30g carbs compared to those who eat a standard diet. Remember, we are low carb NOT no carb. Spend your carbs wisely. Below is what many consider to be a ‘healthy’ diet. 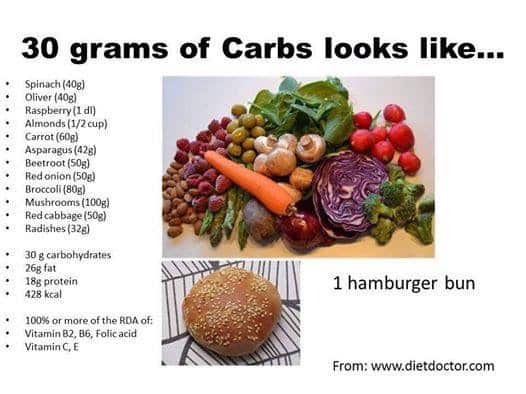 Now you tell me if eating all of these sugars and carbs is good for our health? This just popped up in my pinterest feed again. I’ve been eating the keto way for nearly 1 year now. Excellent article. One myth you could have added (and made an even dozen 🙂 ) is “Eating fat is bad for you / will make you fat”. We know that certain fats are indeed unhealthy, but many others are quite the opposite, and the most efficient energy source. I do a low carb diet that includes one fresh orange in the morning and one slice of Ezekiel sprouted grain toast either with 2 eggs or 2 T. almond butter This is the only way low-carb is sustainable for ME. When I did a fully ketogenic diet I was MISERABLE and suffered from leg cramps day and night no matter how much magnesium potassium, and sodium I made sure I got. I felt deprived and a relentless craving for fruit and bread. By tweaking my diet to include one piece of fruit and one slice of sprouted grain bread, I continued on to lose 138 pounds at age 48 with hypothyroidism. I am no longer pre-diabetic and my blood pressure, triglycerides, C-Reactive HS Protein levels (inflammation markers) and my Magnesium RBC are all in the normal range. I’ve had no feelings of deprivation, no cramps, no lethargy, no more bad breath or re-occurring flu-like symptoms. I no longer listen to any “talking heads” or self-proclaimed gurus. I have found what works for me, and that’s all that matters! and that’s the wonder of keto! we can tweak it to fit our needs! I started just about 11 months ago, because I was finally desperate enough to do something about the chronic (literally all day every day, 4-6 excedrin daily), to give keto a try. That was 4 months after deciding I should at least cut carbs, due to diabetes showing up on both sides of my family tree.) During that time, I started looking for low carb recipes, and kept tripping over keto blogs (and a TED talk). In weeks, the headaches were down 75+%, where it stays, but I have yet to figure out how to avoid changes in the weather, or monthly cycles (at least until the change, lol). I had given up on ever losing weight (I’m 41, and wasn’t obese, but I was overweight, and not happy with my size, or physical fitness). Cutting portions and exercising, or one or the other, had ever helped. To my surprise, keto took off the pounds. Incidentally, I have never been diagnosed with hypothyroid, but based on symptom matching, I believe I was low-normal, and that the secondary test would have called it low. After this much time, I have no cravings for breads (though walking past a bakery still smells good), and find that some sugary foods that I used to enjoy have no pull on me–in fact, some even repel me. Such a timely article for me. Going to cardiologist June 7th and we know how they are about high fat low carb! I just started and plan to keep it up. My weight and diabetes are my problem and I have no doubt that with weight loss, everything else will be corrected! This article will certainly help me present educated info about the diet. The information in this article is…..
Great article! Doesn´t matter how many time I have read this info, it keeps me inspired. Sorry but it didn’t work for me. After six months I was hungry all the time. I was doing 20g carbs, 150g fat, and 75 g protein every day and did not lose 1 pound or a fraction of an inch. And, did I mention, I started wanting to eat constantly after the second month. I was also tired all the time. I was ready for a nap within 2 hours of getting up. Moderate carb low fat high protein works better for me. Not all diet plans are good for all people. 20 carbs is pretty low. I eat about 80-100 per day and have been slowing steadily. Hey Dave. Only 150g of fats? That’s not much! The problem was probably that you were restricting your intake of fats, & in fact restricting your food to 245g per meal. On this way of eating your meals should each consist of 75% fats, 20% protein (about a palm-sized amount), & 5% carbs. When in doubt, add more fats. Still hungry? Eat more fats. Eat only when hungry; eat until satisfied; don’t eat again until hungry again. Doing it that way frees you from set meal times & allows your body to tell you when it needs food, which will usually naturally end up being only 1 or 2 meals a day & no snacks. It didn’t work for you because you weren’t doing it right. Hi I am doing low carb but am sure i sm not eating enougg fat. How can I increase my fat intAke? assuming dave ate EXACTLY as he says he did for 6 months straight (no straying, right? ), then he consumed EXACTLY 1,810 cals/day (based upon the composition that he listed (1g fat – 9 cals, 1g protein = 4 cals, 1g carb = 4 cals). Not knowing how much he weighed when he started, or what his BMI was, it’s hard to gauge how poorly this diet approach worked for him. However, if he was only consuming 20g of carbs/day, he most likely was in ketosis (perhaps there are exceptions to that rule, but they are very rare). If he was in ketosis, and he was consuming what would sensibly be a calorie deficit of some kind for 180 days straight, then it would be impossible for him to not lose weight (primarily weight from fat). Either he isn’t telling the complete truth, or he has a medical condition that has gone undiagnosed. Also, the concept of being hungry “all of the time” for 6 months straight and not caving would make him the most disciplined person in history. If you are in ketosis, hunger is reduced. something just doesn’t add up in all of that. it’s basic math. If he didn’t lose any weight under these conditions, then there is something incredibly unique about his current physiology. the average male needs to consume about 2500 cals/day to maintain their current weight. If Dave (assumed to be average) actually consumed 1810 calories/day, he would be achieving a deficit of 690 calories/day. 690 x 180 days equals a calorie deficit of 124,200 calories. since there are 3500 calories in a pound of fat, he should have lost 35.48 pounds(again, this assumes he is average. Maybe he is a small person. If he is a small person, then maybe 1810 cals is too much to lose anything). Instead, he somehow lost nothing. Hard to fathom. perhaps he should be studied by scientists. The good news is that he doesn’t need as many calories as a normal human. he could (if he wanted to) save a LOT of money on expensive groceries. 150g/fat that’s well over 900 calories in fat alone. Eating that much added fat won’t make you lose fat, you’d just maintain it. Hey Dave, being in a low carb, moderate protein, and high fat diet has lots of other great benefits besides losing weight. You will be able to have better mental focus, anti muscle inflammation, muscle preservation, controlled appetite, physical endurance and balanced blood sugar level. First of all, your body is transitioning from burning glucose to burning fat. This may take anywhere from weeks to months which is different for everyone. It is very important that you consume 80% of your macros from fat like grass feed butter, coconut oil, olive oil, avacado. 15% are high quality protein such as grass feed cows, pasture raised whole eggs, bacon. 5% grain free carbs from leafy vegetables, broccoli, asparagus, cauliflower, and no starchy vegetables like potatoes or yams. Also most importantly you need to read the ingredient labels. It is where most sugar are hidden. 80% of the foods at your grocery store are hidden with sugar. Please stay away from all processed foods and low fat products. They are filled with sugar! Consuming sugar is the biggest reason why you’re not seeing results. Sugar is hidden in condiments, dairy (yes milk!) cured meat, yogurt, cereal, pastas, breads, proteins shakes, protein bars, and fruits (please don’t consume any fruits unless it’s from strawberries, blueberries, and raspberries). Also all fruit juices are high in sugar wether it’s store bought or fresh squeezed. You will need to purchase a glucose/ketone monitor to keep track daily in the beginning. (Amazon sells the monitor called Precision Xtra for about $26) Once you are in the zone then you won’t have to continue to measure your glucose/ketone level everyday. I can assure you that you will accomplish your health goals if you follow these rules. Good luck and I hope this helps! At least you’ve given poor Dave some reasonable advice instead of saying what a medical anomaly he is! I’m a little understanding of Dave, I too did Keto for an entire year, felt great but didn’t loose an inch… I’m still on low carb as I’ve found it a more nutritional way of eating but I do find myself fairly often having hungry days! Even after I’ve just finished eating a hearty meal my belly full I’m not satisfied?! I push through but I find it unexplainable. Good luck to everyone who tries it, hopefully it opens your eyes to more wholesome foods! Libby- Truly outstanding article! You answered just about every question there is… With scientific data links for those who remain brainwashed. Brilliant! I am so glad this has answered all those myths everyone throws at us. The one I have yet to answer is why some people won’t even ask about our LCHF way of eating as they truly think we have gone bonkers and crossed to the dark side! I’m convinced if I went vegan, everyone I know would ask about it and say well done for following my convictions. Strange old world huh? To share any of my posts on Facebook, every page has a set of sharing buttons at the bottom, click on those and it will include the link for you. Spread this far and wide. Let’s remove the LCHF myths once and for all. Fingers crossed. I love my lchf diet and I am a vegetarian. I will eat this way for the rest of my life, I never feel deprived, hungry or unwell anymore. I don’t crave bad foods or struggle to concentrate. I have perfect cholesterol levels and glucose levels. Oh and I have lost 33kgs as a bonus! Similar but subtly different. Low glycemic is merely a representation of how slow the carbs are released into your blood stream, but they are still carbs. LCHF is low carb real food, first and foremost. This page may help explain GI. Knowing the GI of foods is a useful tool, but do not think that if the food is low in GI it is low in carbs, it just means it is absorbed slower. For example, a banana has a low GI of 54 yet contains a whopping 30.8g carbohydrate!!! Thanks Libby for the info…it was helpful in understanding the difference but disappointing as I love bananas !! What do most people use as a guide for #of carb gms they use per day ? How many carbs you eat in a day is up to you, depending on your goals – weight loss, appetite control, diabetes, heart disease etc. Most would regard 50g carbs per day as low carb, less can be regarded as keto, and 50g-100g per day would be considered ‘lower carb’ than the average person would consume but you would still see some benefit. The lower the carbs, the large the benefit and quicker results, but extremely low carb is not for everyone long term. Find what works for you and is sustainable long term. I don’t count anything any more and instinctively know what to eat and how much. thank you so much. I really have no excuse to get myself in gear once & for all !! Low carb looks like my ideal solution …here’s hoping !!! I struggle with keeping my protein at or around 60 grams. Any tips? Trying to lose about 10 lbs. Sheeesh, when I tell people I’m eating LCHF they immediately say HOW UNHEALTHY! WHAT DO YOU EAT DONUTS ALL DAY?????? Arrrrrghhhhh. Society is so behind the times regarding diet. Same 4 me. I avoid telling ppl why i avoid certain foods. Some ppl are so in past😃😃😃😃 still thinking that fat is BAD. Thank you Annie, it’s amazing how many times spellcheck doesn’t pick up my typo’s (I think I type too fast to get the words from my frazzled head into each post). I welcome any corrections, it’s only me here 🙂 Yes low carb has been well known to lower your BP (to normal range) so be aware of this as your medication may need to be lowered. A friend fainted because she didn’t monitor her BP and reduce her medication accordingly. So keep under the watchful eye of your GP or similar. There are scientists that can offer far more advice this than I ever could, but what I hear from numerous lectures I have attended is that this is not actually seen in practice. Whilst you need insulin for T3 T4 conversion, we are low carb not no carb and still produce enough insulin for the conversion to take place. Another cracker, Libby – very plain and succinct . Aren’t there lots of carbs in crackers ?? Thank you so much for writing this great, informative article. I will be linking to it from my blog. Low carb is healthy. I struggle to eat all the veggies that ‘s recommended on the new atkins program. So much so that there’s no place for other food anyway. I’ve even started to give healthier low carb foods to my husband and he also enjoys this way of eating. I no longer buy him bread, but make healthier breads. Thanks for sharing this fantastic article. If people are not convinced by what they read then they never will be. I have been doing this lifestyle for nearly 4 years and it’s the only lifestyle I will follow. Yes, I fall off the wagon now and again it happens. Love all the amazing recipes that are shared ! I lost 60 lbs. in the past year and want to lose another 35 to get on the doctor’s chart for my height. The past 2 months I have neglected eating low carb as strictly as I had in the past due to stress eating and compensating for nerves in the sickness of my spouse. I must get back to what I did for the entire year and eat healthy low carb, including my Xocai healthy chocolate for controlling my fibro pain. The healthy chocolate has 11 carbs for the 3 pieces I need to eat to control my pain. On the days I eat the chocolate, I have to eat almost no carbs for that day. I’m very new to the site, please tell me what is Xocai chocolate used to help fibro myalgia pain. I also suffer from this awful problem. I started LCHF diet just a month back..
And these kind of articles pushes us furthermore to leave that junk behind and live life to fullest. Hello Libby, found your site a mere 3 weeks ago and really appreciate it. I’ve been searching for answers to health issues for nearly 40 years. Like many others I’ve done the rounds of medicos – GPs, specialists & every test they could think of as well as dietitians, nutritionists + the alternative lot with the same results – little lasting improvement with worsening conditions. Heard about Banting and began the search. I’ve begun the change to LCHF/HFLC and even though I’ve fallen off the wagon during special events, I plan to make 2016 my DTC year and know that health benefits will come. Thanks so much for all you are doing for everyone interested in better health and energy. Wow Kathleen, what a fabulous comment to leave. I am so happy that you have found LCHF, my website, and it is working for you. We all fall off the wagon at the beginning but as time goes on it gets less and less (rather than more and more which is all too common on low fat diets). 2016 will certainly be a fabulous year for you and I am certain you will stick with it and be successful. Reading lovely comments like yours really makes all my time here worthwhile. Wishing you a very happy new year, Libby. Hi Libby. 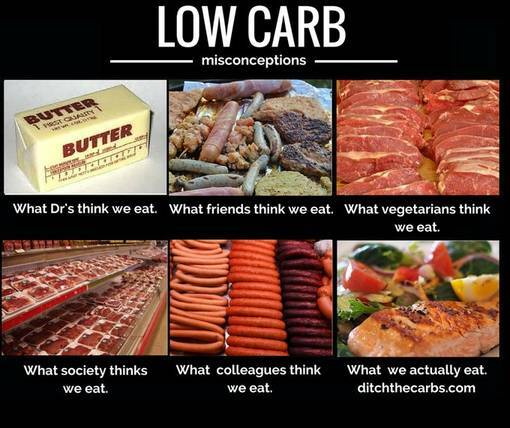 Please can I have permission to use that low carb misconception image on my Facebook page (The Happy Banter). Thank you. Hi Simone, Yes you can share my misconception image as long as you credit and link back to my website and correct URL. I do not allow reproduction of my written work without prior consent. Take a look at what I allow to be shared and copyright rules at the bottom of this page . Thank you for asking, Libby. hooray for common sense, i have lost 18kg since jan this year, this is the best way to eat, and you dont feel hungry at all, because you can eat as much as you like if you want to,of low carb food,still lose weight and feel great,people dont believe it when i tell them all i have done is low carb,i dont exersize due to no time, i have just lived my usual life ,but cut right back on the carbs,yes i think the sugar industry should be very worried, the picture at the bottom of the article sums it up very neatly,we just dont need that many carbs to live a healthy life.